Love the new materials, but I have a slight niggle about how they are made. I know your design philosophy mentions using underutilized items, but I find it odd that a spigot could help create ash. And so on with other examples. Do you think you'll ever try to make some of these part of dragon loot? Or, add a few items to dead dragons that can become these items? Editing dragon loot isn't an issue with a batched patch. 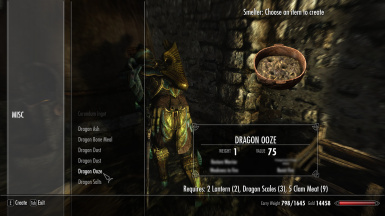 For example...dragon saliva plus dragon sinew - smelter - becomes dragon ooze? A poor example possibly, but getting it all from dragons seems less arbitrary. 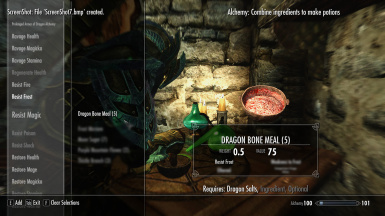 A personal edit I made changes the old recipe for dragon salts into 1x fire salts and 1x dragon bone. Makes more sense to me...not that any of this needs to make sense. Otherwise thanks for making it, its a nice use for dragon parts. Thanks for the comment. I am fully with you on that. I would like to make a different version that is more in-line with your type of suggestions. This one was meant to be a bit of fun and minimally intrusive i.e.. not have to tap into what gets dropped. But I think that is a great idea to make a variant that follows with the nature of your suggestions. I do know of at least one mod out there that adds harvestable dragon components. I can't think of it right now but I know I have seen it. I can't recall either what the components were then used for. I'll look that up. I like the idea of a more serious mod for additional use of dragon and other creature components. If you don't want to build it and I don't find something close already I'll make it. BTW... I refer to your idea as a variant versus definitely in the same .esp file because one would be meant to be appropriately "lore friendly" and make sense versus the intentional nonsensical (give you a reason to gather junk items and pretend they were collectable for a reason) current variant. Those that like the nonsense recipes would also like the lore friendly but many folks playing for more immersion or stricter lore adherence might like the newer variant but not want the tongue-in-cheek clutter item crafting. If I were to do it I'd set it up so that the player would have the option of which group they wanted to install or both or more. Of course that could also be controlled with a flag. Both versions have their charms, I'm just a stickler for my own concept of believability. Most of the elder scrolls doesnt make sense.. Its not as if I even know what ooze is but smelting in a clothes iron just bothers me for no good reason. 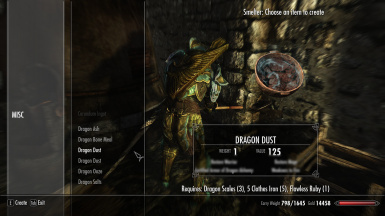 And yeah, I think a few mods tackle the concept of dragon loot. I know hunterborn had some options for taking a few parts from there. There is even a mod that leaves the body intact after you absorb its soul. I would offer to help build it but I have no idea how to. I've only touched the surface of modifying things with tes5edit. I know what you mean on believability. I have a bit of heartache on that same tag for mods. I have this one marked as not-believable and not lore-friendly because I do know what people mean in that and I don't disagree. Of course, the dichotomy of claiming or not claiming "believability" is, in part, the point of the mod. 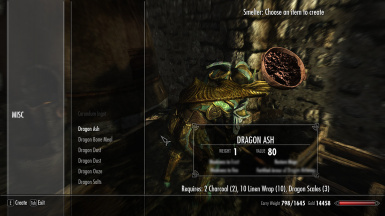 Is it really so unbelievable that when you returned from shouting down a dragon (you SHOUTED at a DRAGON and IT WORKED) that you couldn't throw an old iron you collected along the way into the smelter or is that smelter reserved in believability only for dragon bones and Dwemer metal collected from old automatons. We all know they become molten at lower temperatures than a household clothes iron, right. ;-) Getting an ooze from a smelter is no farther off than liquid from two plants. In both cases we must assume a range of other steps occurred other than our click on a menu to get the result. If nothing else you poured water in a bottle or boiled it to get the potion presumably. In my case... I don't ask you to assume only ask you to find the fun in it. Not to diminish your comment because I know what you mean and can't disagree because it's been designed for a certain level of tongue in cheek and absurdness which can only mean I agree the recipes push believability more than the bounds already in the basic game. But if I wanted to rationalize it for myself in game play to maintain less absurdity I'd simply think that in the case you give (which is a good case and is by no mistake that the clothes iron showed up in that recipe among others) is that the clothes iron is not actually a component of the product though it may be in some amount but that it has been found the clothes iron was produced with certain natural minerals in its metal that are a catalyst for what ever other processes are happing in and alongside the smelter to produce the outcome. The basic metal in the clothes iron is not in use but it acts as a catalyst for other reactions or has minerals that ooze out of it at the right temperature and react or both. How was that? Believable? Probably not, but it's all in how you wish to look at it. Maybe I should make a book on why the components are in use and the role they play to help close the believability gap. I like that idea. Maybe I'll do that but it kind of flies in the face of the intent which was to be a bit silly. And do you really want another book to read? Frankly, I tend to see it the same way as you. I don't really get all excited about throwing a bowl or clothes iron in a smelter but I must say I do now tend to grab these items I wouldn't have before and do so with some joy that I will use them for something I do want. Just twist your mind a little on what the ingredient may actually be doing? I have no idea I just put some junk together so your ideas are absolutely correct, no matter what they are. Though as you have made me now try to rationalize a clothes iron in the smelter, where I didn't really care before other than it was intentionally using junk items, I get more interested thinking about how the recipes could be explained as to why it works. 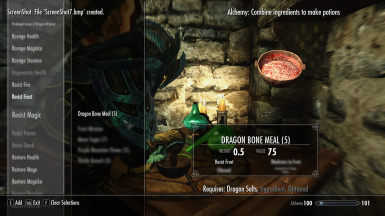 I find I can come up with a thousand recipes that might work for people in crafting and alchemy but I have a hard time coming up with good valuable results. Kind of pointless to craft something to use it for the same old Resist Fire effect. What are some desired effects or results that one would like to have produced??? Open question to everyone or the 6 people that might read this. Oh an Dallas8 - Great thoughts. Thank you. 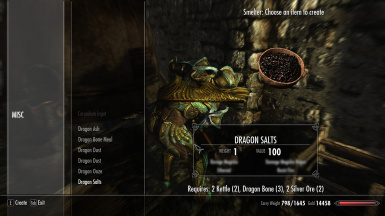 well , i am playing skyrim for a long time ... never found a real need to take potions unless they are the ones that gives a boost in smithing or enchanting , so what s the need for new potions ?! , i know it s a personal op. but i know too that something good can be done like perk potions or potions that gives exp boost in some skills (like training) or dragon soul potions , or materials that if apl. to armors or weapons can augment their properties ... permanent effects in various fields thats it and thats whats needed in my op. .
low very low need for temporary effects . ps: ( if your new materials or potions can do something like that i am sorry for rushing it ) . You are not wrong in that there are no permanent effects of the potions that can be generated- I like that idea where very rare items might be collected for a potion to create an effective permanent perk. In the case of the effective perk I'd probably instead just have it be quest items that when finally collected would grant the perk versus using a created potion as the vehicle. Potions by their nature are temporary. You are correct it's not filling any real void in the game nor was it intended to. Either the bit of casual tongue in cheek approach to obtaining raw materials for ingredients and using them appeals to you or it doesn't. I like to mix it all together across the spectrum from immersion to absurdity and this is one that mixes it up a bit in a tiny and admittedly insignificant mod. ok but why not ading some recipes your way and as hard to craft as you see fit for balance that has the poss. to give some permanent effects should be good no ?!! . I'll definitely keep that in mind. But, you could certainly create such a thing. Frankly, creating something with a permanent effect I would expect to be just a bit more difficult than what I did because a script to adjust a stat such as a skill level would need to be added. I presume the script added to the new effect would be the best way to do it; I'd really need to investigate that to determine the best approach. Sincerely though I'd encourage you to create such a thing on your own even if only for your own use. I don't know how much testing you've done with other mods, but I use Harvest Overhaul, and I was curious if this would be compatible? In my experience, Harvest Overhaul is not a problem. I use that mod myself side by side. I did not encounter nor do I see any conflicts or issues. What are the potion effects ? Agreed - what exactly do they do? Sorry about that. I added at this sticky forum post. I forgot to add the forum entry after the file published. Unfortunately, the forum to be created when first publishing is locked until you publish. It was a chicken or the egg sort of thing and I forgot the chicken or egg after I published. Thanks for pointing that out.